We're entering the home stretch of fantasy football and for the first time ever I'm actually experiencing success. I don't actually think I'll win this year (I just lost a big game), but I'm doing much better than previous years when I'm normally fighting to not be last. The first time I played I had no clue what I was doing. I didn't draft well, lost my first couple games and essentially stopped playing. For some reason, they didn't invite me back the following year. When I got invited to play again, I came prepared. I spent hours doing research on players and actually drafted a good team. I started out well, but it was too much work keeping on top of player news. Honestly, I just don't care enough to invest that much time. So I slowly dropped in the standings and it became less fun. I participated a couple seasons before dropping out. I was asked to join a day before we drafted, which forced me to take short cuts. So I did 2 things: First, I read a couple (like 2!) stories that gave me an overall draft strategy. I also put a handful of players on a short list. For example, they said that if Jimmy Graham is still around at round 4, take him because the amount of points he'll generate is the same as a typical round four player, and he earns disproportionately high points for a tight end. I did just that and the serious players in my league all groaned when I did it. Thanks Internet! The other thing I did was surf the NFL.com video channels. As it turns out, they have a Fantasy Channel. Can you believe there are guys who get paid to analyze the fantasy game and talk about it?! They gave me a couple more names and talked specifically about the NFL.com system and what to look for. So I walked into this draft without a planned list. Instead I had a rough outline of what positions I wanted to fill. 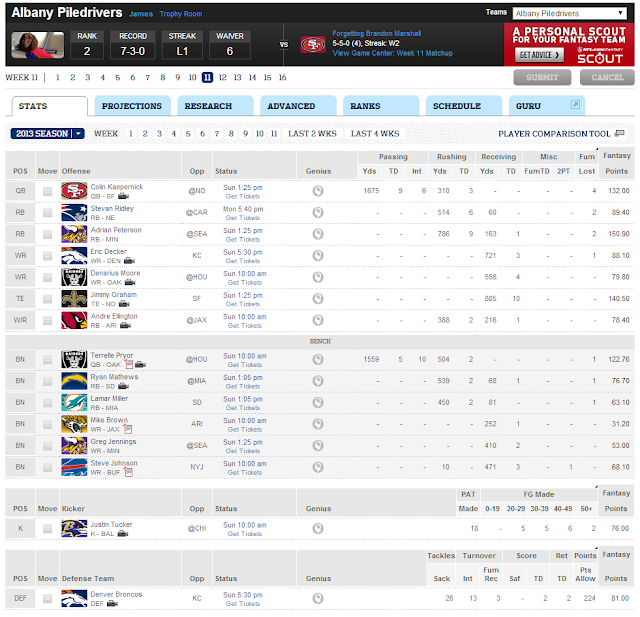 I won't say I dominated the draft (though I did get Adrian Peterson and Jimmy Graham), but I started off with a strong team. If you have a strong team, you don't need to do much movement, but you still need to do some. But I didn't want to spend hours researching. So I let the guys on the NFL Fantasy Channel do it for me. Each week they have a Waiver Wire update where they tell you which players to pick up. They can see what percentage of teams own that player, so they know if that's a person worth talking about. For example, one week Arizona's running back got hurt and his replacement stepped in and did well. They noted that few people had picked up Andre Ellington and that we was going start playing more which equals more points. That's the kind of insight I needed and didn't have in the past! So, I'd watch that week's video while taking notes. Then go search for those players. If they were out performing one of my players, I'd switch them up. It was pretty easy and felt good because I felt like I was making smart moves. The game gets really interesting when you have bye-weeks. Again, I didn't want to do too much work. For my QB/RB/WR I looked for players on the Waiver Wire a week before I need them. Since I was performing well, I was often low on the waiver (ie. if someone with a worse record request the same player, they would get him). By going a week early, it helped me avoid those problems. For TE/K/DEF I just found a sub that week. I kept my main player and used another flex position as a substitute. As a result, I did REALLY well during this part of the season and climbed to the top of the rankings. So, I probably spend 30 minutes a week doing that. I also spend 30 minutes watching game highlights, but I do that every year. It's a way for me to enjoy big moments while not spending hours watching games. If you've ever wanted to play, or like to play but don't like losing all the time, now you have a way to do well without taking up a lot of time. You probably won't beat the person who spends hours analyzing their team each week, but you'll definitely have a lot more fun, which is what it should be all about.